Yamagata Film Critic Workshop Day 3 : Storm Children Book One (Melissa) – ドキュ山LIVE! 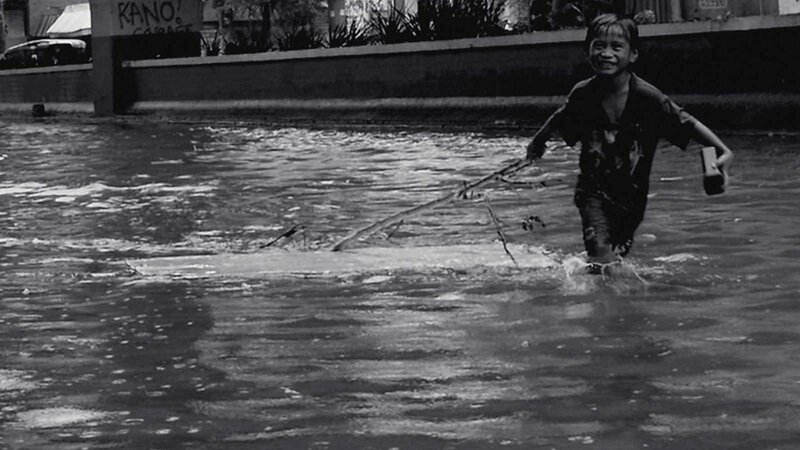 Resilience, radiance, recovery—these are the personal victories of Tacloban’s afflicted youth that Filipino filmmaker Lav Diaz’s radically aestheticised documentary, Storm Children—Book One, unswervingly seeks to illuminate. Chronicled as one of the deadliest tropical storms in Philippine history, Typhoon Yolanda claimed the lives of thousands, leaving only a trail of grief and devastation that lives on in the film’s subjects: young Filipino survivors who, having suffered tremendous trauma, spend their days attempting to re-establish a sense of normalcy in their ruined hometowns. Throughout Storm Children—Book One, Diaz walks with the children in fierce consolation through the wreckage as they seek meaningful ways to cope with their irrevocably altered realities. Diaz treats his young characters with overwhelming reverence, evidenced in the deliberate physical and emotional space that the camera is careful to keep. Aware that the tumultous emotional process involved in new beginnings—trepidation, adaptation, experimentation, navigating the unfamiliar—has already commenced for the children, Diaz approaches his subjects from a place of quiet, unobtrusive observation, as though his lens is another kid in the village, a loyal compassionate companion who understands the beauty of silence. Diaz does not interfere, offer advice, or coax stories of grief. When a boy crouched on a ledge buries his face in his hands, the camera is static with focus kept purposefully blurry, preventing us from scrutinizing the boy’s features. Diaz’s message is clear: we are here not to pity these children, but to marvel at their endurance. Meticulous aesthetic attention is paid to framing and mise-en-scene. 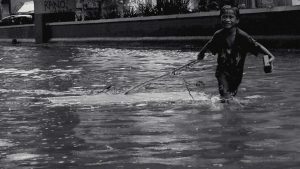 The striking visuals and diegetic sound choices intentionally break any concept of the documentary as an exploitation of poverty. Crisp, stunning black-and-white visuals render the wreckage beautiful, and every unhurried shot feels laden with meaning. As kids splash gleefully in flooded streets at the film’s start, the monochromatic colouring inhibits our ability to gauge the dirtiness of the water, likely teeming with car oil, street dirt, rodents and litter, as if to say, this is not the point: the children are the point. Diaz’s deep repugnance of emotional exploitation is evident in his preference to show, rather than say. His reactions remain neutral, and he makes no attempt to coax words from the children. “That’s my house,” a boy tells Diaz, pointing to a tent. “But I’m not ashamed of it.” The director’s response is measured: “No, of course you shouldn’t be.” Ethical questions about poverty and activism simmer beneath the surface of a brief scene in Leyte, when white tourists stop to take photographs with a group of grubby children in the remnants of a doorway before vanishing into the distance. Midway through the film, we follow a lone young boy who works as a water carrier. Only after a significant time has passed does Diaz allow a single close up, his lens staying far enough away as to observe without voyeurism. The camera rests on the boy’s face, innocent and unblemished, eyes bright and curious, before Diaz abruptly cuts away to a new scene, a new story. His dedication to maintaining respect for the children is unwavering: they are not victims, they are survivors.